Just far enough away from the city center hustle and bustle of Hollywood is casual coastal Hermosa Beach. The sunny weather and gorgeous coastlines of Hermosa Beach combine to be the perfect site for your next Los Angeles area team building event. After a day of meetings, imagine you and your team stopping in one of the popular bars or pubs along the pier for our fast-paced Game ShowDown game show event or a competitive beach Olympics tournament on the sandy beach. And even though it’s a beach city, don’t forget that Hermosa Beach is just a few miles south of LAX international airport, and the glamour of Beverly Hills and the glitz of Hollywood are also just a short drive away. By having your next team building event in Hermosa Beach, you’ll have the best of both worlds; the quiet coastline with big city attractions. 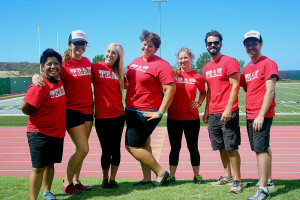 Call us at 877.267.1939 to plan your next Hermosa Beach team building event or email events@fireflyteamevents.com. View our activities list to see what we can offer your team in Hermosa Beach and throughout the areas of Los Angeles. Hermosa Beach Sand Sculptures – Surf and sand on the Southern California coast are the secret ingredients for this creative and competitive event. You and your group will have sculpting lessons to show you how to pack and carve the sand towards building bigger and taller masterpieces. Judges will be looking for creativity, height, detail, and how well your team used the theme set out for the competition. Who are the Creatives? Managers? Builders? You’ll need them all if your team is going to win! 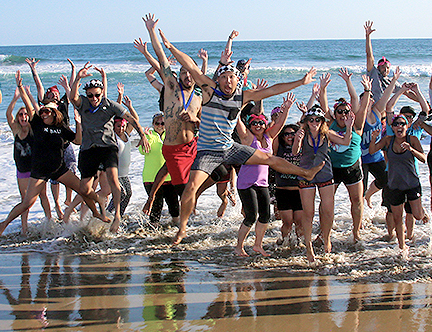 Hermosa Beach Team Olympics – Your teams will compete in head to head Olympic style challenges, right on the beach! They will need to communicate, assume leadership roles, problem solve, and trust each other if they want to declare victory over all others. 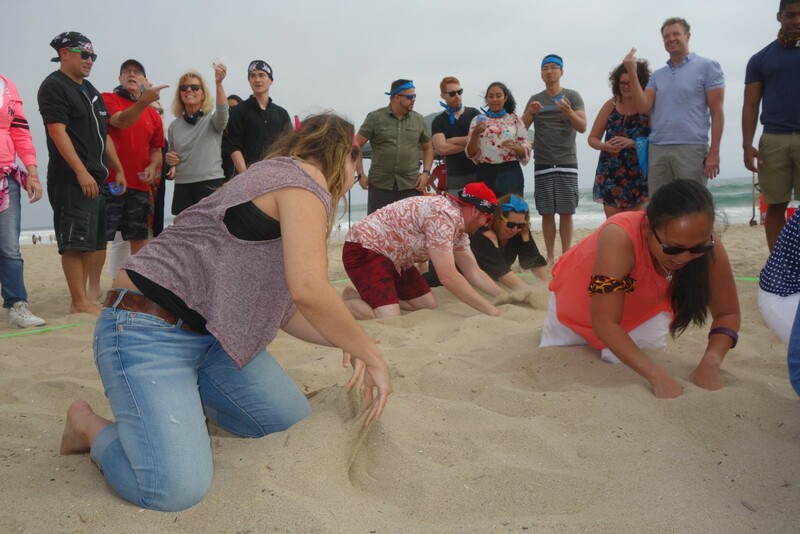 We can produce these team building events on the beaches in front of the popular Hermosa Pier or even on a grassy field of a local park. Hermosa Beach Game ShowDown – Teams compete in rounds featuring video, audio, and knowledge trivia. We also mix in bonus rounds that are based on classic games like Wheel of Fortune, Jeopardy, and Family Feud. Imagine a pub quiz format but WAY more fun. This event pairs beautifully with drinks, so after a day of training, head out to a bar on The Strand and get ready for Game ShowDown! We deliver 5 star customer service to our team building customers. You will receive quick communication, confident experienced staff, and detailed event production. Our goal is to make sure all our clients leave with a smile. Confident – Our staff understands customer satisfaction and have the experience to deliver an event flawlessly. You’ll get smiles and a smooth event that your guests will love. Audience Specific – Each of our groups is different and we understand that. An event that makes sense for a Sales group isn’t necessarily a good fit for Human Resources. We believe in digging a little deeper to ensure your team has a positive memorable experience. Creative – Challenge us! We love innovation and creativity. You won’t find cookie cutter games, challenges, or corny deliveries on our events. Current – Keeping up with current cultural trends, hot topics, fads, and even new vocabulary is important to us. The business and cultural landscape is changing rapidly with advances in technology. We understand that to remain vibrant we must be relevant. The Strand is a flat beachfront sidewalk frequented by walkers, joggers, bicyclists, and skaters. It’s a perfect people watching spot during the day and becomes lively after sunset when visitors and locals alike pack its many restaurants and bars. If your team needs to get outside and breathe in the clean ocean breeze after a sales meeting, The Strand fits the bill perfectly. It’s less crowded than the beach in front of Redondo Pier and offers the widest sections of beach in the city. If beach volleyball is your thing, there are plenty of volleyball nets for you and your group to work up a sweat. Speaking of working up a sweat, you should note that the quickest path of access to Avenue C Beach is a steep 72 step staircase. At least you’ll have an unbeatable ocean view while going up and down the steps! Ideal for kids or the kids at heart, the Hermosa Beach Penny Arcade will bring a rush of nostalgia without breaking the bank. It’s conveniently located right on Hermosa Pier. While playing the arcade games, draw inspiration and get your team hyped up to play our Team Arcade – Design Challenge team building event. This upscale hotel is nestled right up on the beach. In addition to being located across from Hermosa Beach, it’s also walking distance to cafes, nightlife, and surf shops. It’s a perfect home base for your next corporate retreat or meeting in Hermosa Beach. The Beach House Hotel itself has over 3,000 square feet of versatile meeting and event space.